My daughter the Cake Princess looked quizzically at the dough laid out on a wooden peel in the kitchen. “Do you make pizza every day?” she asked, striking a pose. “Just this week,” I assured her. “Yeah, right,” she said, and flopped off to check her facebook page. We’re all fired up on pizza crust just now at Chez Bullhog. After test-driving the new pizza crust yeast, I got caught up in a creative frenzy – thin crust pizza, thick yeasty pizza, with red sauce or an oil base, meat or veg, long rising or quick dough; you name it, I’ve made it. I also got caught up in several conversations that left me with an undeniable conclusion: everybody has an opinion out there about what is ‘best’. In my book, the ‘best’ pizza is the one that’s in the oven right now. (Truth be told, I love them all, but the fresher the better!) Therefore, the ‘best’ crust is the one available when you need it. If you’ve got a slow-rising dough in your fridge, well then more power to you. Otherwise, pizza crust yeast can cut the time and give you a pretty good crust in a hurry. Here’s a pizza made with a fast-rising dough that’s easy to make and stretches well in just 90 minutes. With this dough, you can make a thin(ish) crust if you like, or use all 17 ounces for a thicker crust. The combination of sweet tomato slices and savory mushrooms, tinged with the delicate overtone of truffle oil ensures this pizza will be devoured instantly. Careful – it might not make it to the table! 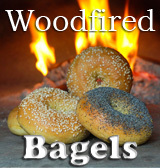 For baking in a woodfired oven: Start the fire 2 hours before you plan on baking the pizza, and build up a mature fire with a nice bed of coals in the center of the oven. Half an hour before baking, put several 2-inch thick sticks on the fire and, once they’re flaming, split the fire. Put one fire to each side and feed small pieces of wood when necessary. You don’t want a superhot fire for this pizza; the oven is ready when ash on the side walls and top is tinged with white and you can maintain a low flame on the fires. Make the dough: In a small mixing bowl or 2-cup measure, mix the two flours. Put 1 cup of the flour mixture into a large mixing bowl and combine with the salt, sugar and yeast. Add the water and, using the handle of a wooden spoon, mix until smooth. Mix in ¾ cup more of the flour, scrape down the sides of the bowl if necessary and form a ball. Let the dough ball sit for 15 minutes, covered, before kneading. Knead the dough for 5-7 minutes on a counter sprinkled with the last ¼ cup of flour. Return to the large bowl, cover and let rise for 1 hour at room temperature. Cook the mushrooms: Sautee mushroom slices in a bit of olive oil and a teaspoon of water over medium heat for two minutes. Toss the mushrooms with a sprinkle of salt and pepper. Turn the heat to low, clap on the lid and let simmer for 5 minutes. Let cool before using. Make the crust: This recipe makes 17 ounces of dough. 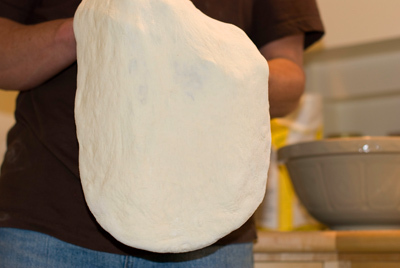 For a thinner crust, use only 13.5 ounces (weigh this out or discard about 20 percent of the dough). Punch down the dough, removing much but not all of the air. Spread the dough into a pancake shape, let rest under a cloth for a few minutes, and then work at it again. Gradually stretch the pancake of dough with your fingers, turning and flouring lightly as necessary to keep dough from sticking to the counter. Flop it over the back of your hands to stretch it out. 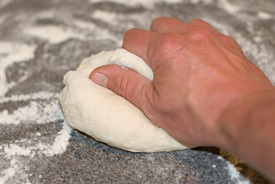 The best results will follow from spreading the dough and allowing it to rest for a few minutes. Spread a little more and then a rest. If one spot gets too thin, avoid working there. Stretch and press by steps until you have a 14” pizza blank. 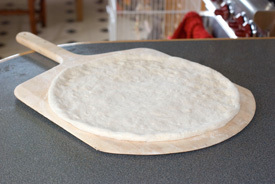 Carefully move the pizza blank onto a wooden peel which has been dusted with flour. Top the pizza: Coat the pizza blank with a tablespoon of olive oil, leaving an inch uncoated at the rim. Distribute tomato slices and mushrooms on the oil layer and give them 10 or 12 shakes of salt. Top with cheese and finish with a sprinkle of oregano. 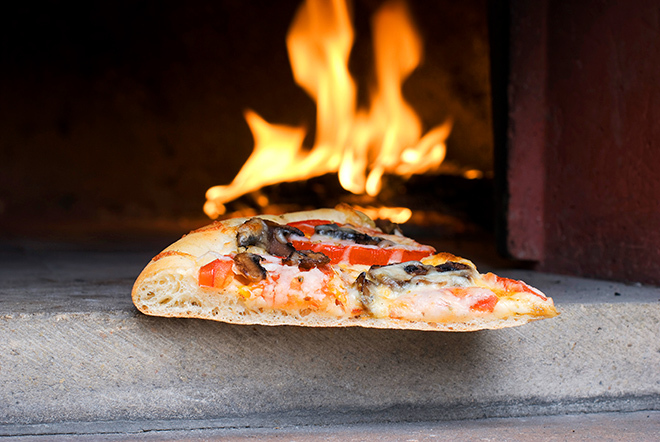 Bake the pizza in a woodfired oven: Spread the coals along the side walls of the oven and brush the center floor clean of ashes. If possible, use a bellows to clean up the floor and to make the coals glow. It’s okay if there’s a bit of flame on the fires, but not too much. If there is no flame at all, put two thin sticks on each fire and wait until they have burned partway before putting in the pizza. Slip the pizza onto the floor between the fires, and bake for 8 minutes, turning the pizza around with a metal peel halfway through baking. Bake the pizza in a conventional oven: Lower the oven temperature to 425º. Slip the pizza onto the pizza stone or quarry tiles, and bake for 12 minutes, turning the pizza around halfway through baking. Pizza is ready when the crust is slightly browned and the cheese is bubbling. Top with truffle oil: Drizzle with truffle oil (just a little!) and serve piping hot. The Cake Princess and 4 or 5 of her friends converged on the kitchen as this pizza came out of the oven the other day. Her protest – “Ew, mushrooms!” – was dulled by the clattering of plates as her friends helped themselves to great huge slices. In minutes, the pizza was gone. My daughter turned her quizzical look on me again as her friends trundled past licking their lips. After all, maybe it’s not so bad having a father who makes pizza every day. I didn’t say anything, but inside I was grinning. Ear to ear and loudly. Ever seen a dough do this after 90 minutes? Pretty cool, I'd say! Perfect pizza for this time of year as my vegetable garden is getting ready to produce a boat load of tomatoes! I LOVE THIS. I LOVE THIS. I LOVE THE ADDITION OF TRUFFLE OIL. Holy moly. I love this. can ya tell? Can I be your neighbor so I came come over and have pizza everyday? This pizza looks great and sounds ever better. Your daughter is very lucky to have such a talented pizza maker. I see you’re loving the pizza yeast! The truffle oil sounds so good with the mushrooms. Truffle oil and pizza – Fantastic! I agree wholeheartedly – the best pizza is the one in the oven. I’m getting ready to make pizza and that truffle oil idea is wonderful. Your family is certainly lucky! Yum! This makes me want pizza!!!! Do tell, does truffle oil have a lot of flavor? I love truffles and was just thinking about experimenting with some truffle oil, but wasn’t sure if it carried a lot of truffle flavor. This is great Don. I use truffle oil frequently and it adds a nice flavor. 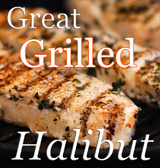 I’m definitely going to try this recipe. 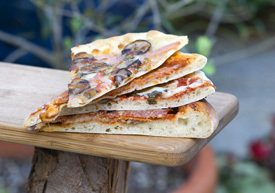 I just bought a Forno Pizza Oven and have been looking for recipes all day.